Mitch was my childhood friend, Sandee’s, husband. She died almost six years ago of leukemia. Mitch never got over her loss, but fought to raise money to cure the disease that took her until he could no longer. Mitch died of glioblastoma, which 60 Minutes referred to as “the most efficient, relentless cancer of the brain.” See their May 15, 2016 piece on the Duke University clinical trial using the polio virus to combat this killer cancer here. The only consolation any of us have is believing that Sandee and Mitch are reunited eternally in love. They leave the legacy of a remarkable, wonderful family and a vast number of devoted friends. Our family is deeply saddened to announce that Mitch passed away this afternoon (September 15, 2016). His brother, Bruce, was sitting with him and his children nearby, as Mitch gave one last sigh. As you all know, Mitch was diagnosed with a malignant brain tumor almost exactly one year ago. It was a tough year without much luck. But Mitch did his best and fought until the end. We are so proud of him and relieved that his passing was peaceful and painless. Funeral: Sunday, 9/18/16, at Goldstein’s Suburban North Chapel, 310 2nd Street Pike, Southhampton, PA at 1:00pm. 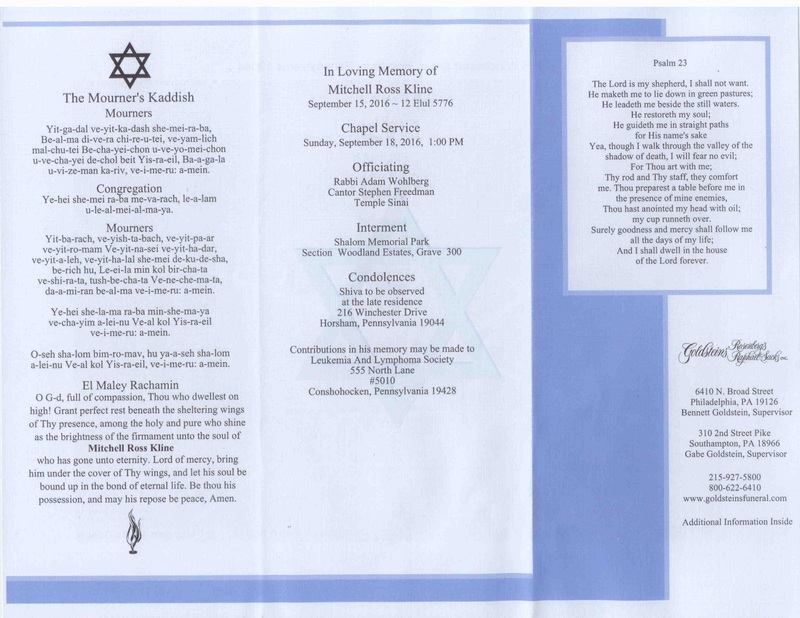 Burial: Forest Hills/Shalom Memorial Park, 25 Byberry Road, Huntingdon Valley, PA.
Shiva (the week-long mourning period): Observed at Mitch and Sandee’s home, 216 Winchester Drive, Horsham, PA 19044. Friends and family are welcome to pay their condolences Monday thru Friday after 2 pm. We encourage those who can help complete the minyan to arrive in the evening for Maariv. Thank you all for your concern and care during this very challenging time. We feel so grateful and blessed to be surrounded by such amazing support. Anyone who feels inclined to make a contribution in Mitch’s honor is invited to donate to the Leukemia and Lymphoma Society (a cause very dear to his heart).